When Warren Buffett talks, people listen. Any time the legendary investor weighs in on market matters, either through his words or through the actions of his investment vehicle, Berkshire Hathaway (BRK.B), knowledgeable investors pay close attention. That’s why the release of Berkshire’s annual report each February is such an eagerly anticipated event: It includes Buffett’s annual letter to Berkshire shareholders, in which the Oracle of Omaha gives his take on recent events and drops nuggets of investing wisdom. This year’s letter (released Feb. 27 and available here) is as quotable as ever, as Jason Stipp reported after it came out. Another reason for the widespread anticipation of Berkshire’s annual report is its insights into Buffett’s investment decisions from the previous year. While many were revealed during earlier disclosure, the annual report provides the big picture, including a list of the biggest holdings in Buffett’s investment portfolio. 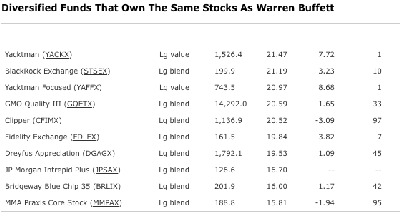 Morningstar’s Bill Bergman recently analysed Buffett’s 2009 trading activity, including his top 10 stock holdings as of Dec. 31, 2009. Berkshire’s top equity holding is still Coca-Cola (KO), where Buffett is the largest shareholder (and a board member); the list also includes Burlington Northern, the railroad Berkshire recently bought outright. (The deal didn’t close until this year, so Burlington Northern was still publicly traded as of Dec. 31.) 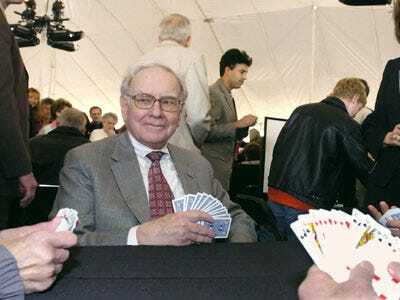 Essentially all of Buffett’s stock holdings are big, stable, profitable companies with solid competitive advantages–the same type of business he has always preferred. Plenty of mutual fund managers are Buffett fans who emulate his investment approach in one way or another. Last August we took a look at mutual funds with the biggest Berkshire Hathaway stakes, including such excellent funds as Sequoia (SEQUX) and Clipper (CFIMX. When Buffett announced his plans to buy the rest of Burlington Northern back in November, Ryan Leggio looked at funds with the biggest stakes in that stock, which jumped in price when the deal was announced. 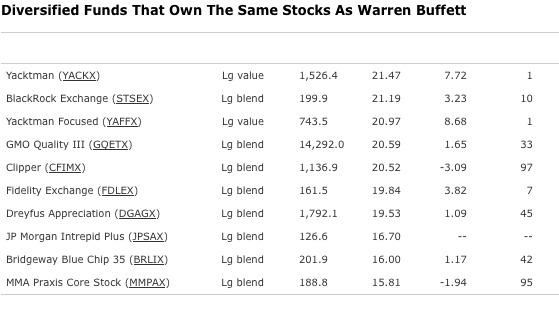 In a similar spirit, we decided to look at funds that are the biggest holders of Buffett’s other favourite stocks. We calculated the funds with the largest combined percentage of their assets in Berkshire Hathaway’s top 10 stock holdings other than Burlington Northern. Those remaining nine: Coca-Cola, Wells Fargo (WFC), American Express (AXP), Procter & Gamble (PG), Kraft Foods (KFT), Wal-Mart (WMT), Wesco Financial (WSC), ConocoPhillips (COP), and Johnson & Johnson (JNJ). Two of the top three funds on the resulting list are consumer-staples sector funds (Vanguard Consumer Staples Index (VCSAX) and Fidelity Select Consumer Staples (FDFAX), which is not surprising given that Coca-Cola, Procter & Gamble, and Kraft are three of the biggest names in that sector. We restricted the final list to diversified funds with at least $100 million in assets. Within those limits, the following table shows the top 10 funds, including each fund’s category, size, and category-specific annualized return and percentile ranking over the past five years through March 10. Yacktman (YACKX) tops the list, with sibling Yacktman Focused (YAFFX) close behind. Donald Yacktman and his son, Stephen, manage both funds, employing a Buffett-style investing philosophy. They looks for profitable companies, usually with little debt, that are trading at a substantial discount to his estimate of their intrinsic value. While most of these are big blue chips of the type Buffett holds, including top 10 holdings Coca-Cola, ConocoPhillips, and Procter & Gamble, Yacktman is also willing to hold smaller stocks that fit his criteria, such as AmeriCredit (ACF) and Lancaster Colony (LANC). While this strategy sometimes goes out of favour, as it did in the middle of the past decade, it has worked extremely well over the long term. These two funds are among the best-performing large-value funds over the past five, 10, and 15 years, and Donald Yacktman was one of the finalists for Morningstar’s Domestic-Stock Manager of the Decade. Clipper stands out because it’s the one fund on this list that’s also among the most prominent holders of Berkshire Hathaway itself. It’s managed by Buffett fans Chris Davis and Ken Feinberg, who also manage Davis NY Venture (NYVTX) and Selected American Shares (SLASX), both of which, along with Clipper, are Fund Analyst Picks in the large-blend category. (Davis and Feinberg also subadvise the #10 fund on our list, MMA Praxis Core Stock (MMPAX).) Berkshire Hathaway was the second-largest holding in each of these funds’ most recent portfolios, and they all also had at least one of the nine “Buffett stocks” among their top five holdings. In Clipper’s case these are American Express and Procter & Gamble, which together take up more than 15% of assets. These stocks represent a higher percentage of the more concentrated Clipper, which has only 24 holdings, in contrast to about 90 each for Davis NY Venture and Selected American Shares. The rest of these funds have a similar focus on high-quality blue-chip stocks trading at attractive prices. GMO Quality III (GQETX) is advised by Grantham, Mayo, Van Otterloo & Co., whose cofounder, legendary value investor Jeremy Grantham, is a longtime market pessimist who has made some accurate predictions, and a longtime advocate of buying cheap, high-quality stocks. Dreyfus Appreciation (DGAGX) counts Coca-Cola, Procter & Gamble, and Johnson & Johnson among its top holdings; it’s subadvised by Fayez Sarofim & Co., a firm that has achieved excellent long-term results by investing almost exclusively in big, highly profitable companies with strong competitive advantages. Of the 10 funds on this list, only the two Yacktman funds have beaten Berkshire Hathaway’s 6.4% annualized return over the past five years, illustrating how tough it is to beat Buffett. Even so, these funds have mostly been strong performers over the long term, with all but the two Davis-Feinberg funds beating their categories over the past five years. (Clipper and MMA Praxis Core Stock got hammered by some bad financial bets in 2007 and 2008, but they’ve since rebounded strongly, and we remain big fans of Davis and Feinberg.) That long-term strength illustrates why so many people pay attention to Buffett’s portfolio, and why emulating his general approach has been a winner over time.